This blog post is all about how I wrote my first poetry book ‘A Liberated Sheep in a Post Shepherd World’ inspired by the final copy proof landing in my hands this morning!!! I love poetry and have always dreamed of the day when I would at last embrace my own book. Poems that I could share with everybody, including my family and friends. The happiness that I feel today is incredible! My confidence and faith, wholly restored. I have been bouncing up and down the street and walking around the supermarket with the silliest looking smile you ever did see! A natural high with a wonderful sense of achievement that on more than a few levels, means the world to me. This book has been such a long time in the making, more than thirty five years to be precise, so why publish now, here in mid-life I hear you ask? Let me return to the beginning when, during my mid-teens, I first started writing poetry. Somehow I knew that my poems were vital yet at the time I didn’t understand why. Cherished, I kept them in a large brown envelope which I hid under my bed and even today can remember the importance I placed on packing them before I left home three years later. I continued to write poems into notebooks throughout my life. In all, I kept nearly two hundred of them, the majority of which have made it into the book. Without a record of who I was twenty or thirty years ago I decided it would be difficult for me to discover who I am becoming today. As I neared mid-life, I had more than once thought, what will happen to my poems when I die, where will they live? I guess others ask similar questions about their own creative expressions. When reflecting on my mortality I noticed one clear question emerged, “What have I failed to express, to create, to write?” Then it dawned on me, I had not written ‘the poetry book’ and it was from this moment that I understood how important it was to complete this task. For the thought of dying before doing so felt too sad to contemplate, so I decided after my 50th birthday I would set about gathering up my poems. As I didn’t know anything about the publishing world I chose self-publishing. At the Blurb website I discovered I could make my own book for around £20. What joy! To have been born in an age where you don’t need a publisher to put your work out there. Ok, back to the book itself, I chose a chronological order starting with my teenage poems and worked towards my 50th year. The poems themselves naturally fell into seven chapters, I didn’t plan this at all. I then took the title of a poem for each chapter and put the poems in alphabetical order. I had already written a Postscript so added that as the final poem in the book. By now my poems were already set up in Word in the order that I wanted them to appear. Next I downloaded the free BookSmart software from Blurb and began to copy my poetry into the pages provided. I designed the covers, added images and the book was finished (or so I thought!). Finally I checked for spelling, grammar and alignments and corrected quite a few mistakes. Why do I always put the apostrophe in the wrong place?! For my font I used Palatino Linotype size 10, with my poem titles I bolded them at the same size. When my book was finished I just pressed ‘Publish’ and my book was uploaded, a process that took around eight minutes. More trivia, I ordered my book in Trade size which is 6 x 9 inches, 15 x 23 cm with a soft cover, printed in black and white with cream pages, this seems to be one of the most popular formats for poetry/fiction. Once the book had been uploaded it was ready to buy! I ordered a copy and it arrived around ten days later. Immediately I sat down (after whooping for joy!) and started editing it all over again, as when the book lands in your hands, trust me, you start noticing typing errors you’ve previously missed. I wasn’t happy with the front cover image and decided to re-shoot, which meant waiting until late spring when the lambs were young. That didn’t happen but luckily my partner had already taken the perfect image. By then (several months later) I had written more poems so I added two more chapters and, after more tweaking, I finally uploaded the new version of my book ordering another copy which has arrived today!!! The total outlay cost for one copy was around £20 which included printing, shipping from Germany and home delivery. Worth every penny and so much more! Not a huge price to pay for the realisation of a dream. When the last of my poems were added, much to my exhaustion, ecstasy and liberation, talk about labour pains, I breathed out a deep sigh of relief as the book in its final form was born. Today I’m euphoric to see my soul journey in print for the first time. I feel truly blessed. It’s all here, my journey from fifteen to fifty within my one hundred and fifty five poems. Oh my goddess what a passage it has been to reach midlife with all its necessary crisis’s and corrections along the way. Each poem brings with it an element of self-discovery, revealing an aspect of my personality that had previously laid dormant. The gift of my journey is inestimable. Along these thirty five years I learnt the value of the ordinary, the richness that lay deep within. I learned to trust the process, keep my life simple and find my way home. 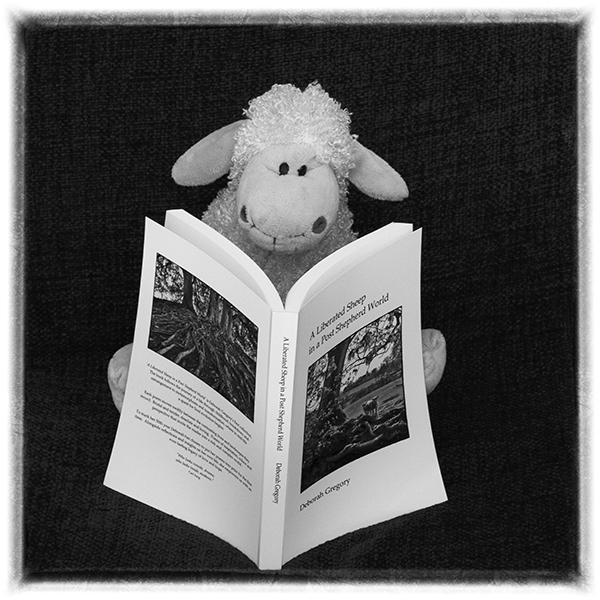 If you are interested in purchasing a copy of “A Liberated Sheep in a Post Shepherd World” please visit the “About” page and follow the title link. For worldwide deliveries please hover over the union jack (top right) to find your own national flag, if you cannot see it there please click on the “other countries” tab. Good luck in manifesting your own creative expression. Prepare to meet the unfamiliar in yourself and if you want to see where you are going, ‘look back, look back, look back!’ Go after your beautiful day! A Blessed and Happy Mabon, the Autumnal Equinox to all! Thank you for reading. I’m so glad you did it, Deborah–and that I got to read about it. This is the first time I’ve seen this piece. What a big process it is and what a gorgeous outcome. I like your thoughts about manifestation. Thank you so much Elaine for your wonderful support and encouragement! I wanted to share, and attend within this post and my final poem, “Postscript” the reasons “why” and “how” I wrote my poetry book … hopefully to encourage others to “manifest” their own creativity. Love Deborah. For my blog series about the (female) body I have saved the last one to be about the body of poetry. There are not many famous female poets unfortunately. Let me know if you’d be interested or inspired to write about this as a guest post, i would love to hear it. Please don’t feel obliged to say yes, i will accept any no with understanding and grace. Thank you so much Susanne for reading about how I formed my body of poetry and your wonderful offer. As I’m fully absorbed in writing my Poetry of the Tarot series, I have no time outside of work to focus on other themes … however, I would like to share that after more than thirty five years of birthing poems, and finally offering them to the world, I feel that the literal form of the book, has balanced the Feminine within and completed the whole process. Manifestation, bringing into being, is what the Feminine principle does so well. I realise that I could have sat on these poems forever, kept them hidden away in a dark drawer but when I asked myself those questions within this post I felt a sudden urge to bring them together, and become more than a name on my family tree. I write more about these motives and reasons in my final poem, Postscript (see hyperlink on page, in blue). Many thanks again my dear friend! Blessings always, Deborah. Congratulations Deborah, I am smiling for you. This is a totally inspiring post!! Thank you for your most generous feedback taruna and for all your wonderful comments on my poetry, truly appreciated. I’ve woken up smiling away! Love this blog Deborah cos it not only tells of your journey to where you are now but it equally helps others in their journeys to where they need to be. It explains the process in very simplistic terms – which always helps! And as poets we all like to dissect not only the words of the poems but the heart and the soul of the poet themselves. This way we begin to slowly unravel the poet and thus have a deeper understanding of their words. Thank you so much Bathsheba for your truly supportive and most encouraging response to this particular post! I absolutely love writing these blog posts, time permitting outside of work and always wanted to share the simplicity at which a person could, if they desired, have their work published and put ‘out there’ for just a few pounds and minimal effort. Congratulations Deborah – it must feel wonderful to have all of that work and your life gathered together. What a labour of love that must have been and a dream come true. How wonderful! Congratulations, my friend, congratulations, something about seeing your words in print that makes it so real. Also completing this project, so well done Deborah. I would certainly love to support it, let me know where I can order it. You’ve inspired me as well, started the process on createaspace but have been procrastinating. You are the light in the darkness. Thank you so much Steve for all your wonderful encouragement and amazing support over these last few months. I love how you turned on ‘the light’ and helped me through many dark moments when I was all to ready to give up, although the thought of facing my mortality without this task completed pushed me on greatly. Oh my goddess you have to do it, the feeling of holding my work in my own hands this morning was beyond the beyond, the sense of achievement overwhelming. Yes, I will send you details of how to buy a copy. Ooh this is so exciting, hopefully it will encourage other poets to put their words into print too, after all we are more than our names on the family tree. Congratulations!!! So excited to hear your dream realized! What a gift to be able to see your past 35 years in art form created by you. Inspiring post!!! Thank you so much Lily that’s so lovely of you! I’m all lit up with happiness today, a beautiful dream come true to see my soul journey in print for the first time.